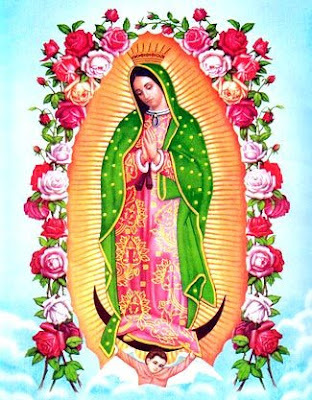 Today is a day set aside to honor The Lady of Guadalupe with pilgrimages and feasts. It's one of my favorite stories about the appearance of the Virgin Mary to the common world. You can find the Story of Our Lady of Guadalupe here. I'm no longer a "religious" person. I affiliate with no religion but have attended many to come to this point. Presbyterian, Methodist, Lutheran, Nazarene, Baptist, Latter Day Saints, Jehovah's Witness, Catholic, Worldwide Church of God, all basically the same beliefs. In my opinion, Religion serves more to separate us than to bring us together. So, what do I believe? That the Creator is a male/female entity. Moral behavior. Giving without expecting anything in return. Compassion and understanding for others. Forgiveness. Love. Non-Judgement. Tolerance. Equality. Honesty. Kindness. The Miracle of Birth. The Gift of Life daily. Inevitable death with no proof of what, if anything comes next. For me, knowing what we get is what we get makes it more important to live every day to its fullest. I think everything else, the Bible and all books like it, are all about getting us to see these wholesome qualities with stories and legends. We see heroes AND heroines, leaders, followers, right choices being made, wrong choices being "punished", healing and compassion demonstrated. They are qualities found in all creation stories and "religious" teachings. I think it's important for me as a Woman to celebrate and acknowledge the women of these stories. Yes, we will be having a Feast tonight. Whether you want to call it the Sabbath, a Sabbat, celebrating the Full Moon, The Feast of Our Lady of Guadalupe, or just Friday night dinner we will be eating hearty and giving thanks.